I'm not gonna deny I waited a long time for this one, friends. 1985 was a great year for pop. It saw Whitney Houston's official debut. Lisa Lisa & the Cult Jam, Tears For Fears and a-Ha were on the radio. Madonna was just starting to get "Into the Groove". And it was also the year Mandy Ventrice was born. 1985 does what good introduction pieces do (although to be fair to Mandy -- this is hardly an introduction for those of us who've been following her for awhile now) -- it plays to the artist's strengths and broadcasts a large range of supreme listen-ability to tug at the heartstrings of just about any type of music listener. 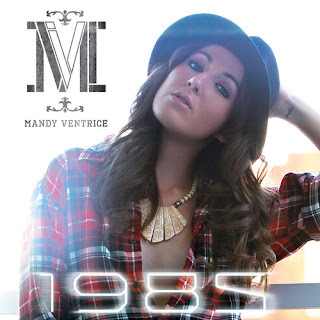 At the same time, Mandy manages to establish her "sound" while still being entirely versatile in terms of true "genre". Her true calling card is her penchant for writing familiar, relatable and singable hooks (complete with plenty of ooh-whoa-ohs) that get stuck in your eardrums, but in a pleasant kind of way. 1985 also works rather effortlessly as a kind of concept album; heavy or light, many of the songs can be described with a 80's influence. EDIT: Added Bonus --> Mandy has offered the one-off "Die Happy", which was also recorded during the 1985 sessions, as a free download via her SoundCloud. In my personal preference, the six-song set reads a bit like a dalliance in my daily life -- the tip of the iceberg kind of soundtrack in terms of how I feel as a young woman, lyrically painted much more poetically than I could have ever hoped or done myself. Click beyond the cut for a track by track breakdown. Best Bit: It used to be better than this.../Tell me does it get much better than this? Perfect For When You're Feeling: a little nostalgic about how good it used to be, and by "it" I mean music, your personal life or just in life in general. Best Bit: the cascading, Alicia Keys-esque bridge. Perfect For When You're Feeling: "so burned out" and as a young person in this economy, that burn out happens much more frequently than I'd like. In my case, it's usually due to the day job. Can I get an Amen? This was faraway my fave from the project when I heard some of the songs mid-last year, and I premiered the song on my Pop Power Hour radio show at Resolution Radio. The lyrics are some of her most picturesque in my opinion, and the music-box piano is the perfect complement. In A Nutshell: there's a reason why this is the centerpiece to the record -- it's the sparkling highlight with no question and is the "must-hear". Best Bit: the piano backdrop; I'ma tell you lies/Cuz the truth get in the way; You say you want me to be happy/As you break my heart real slow; truthfully, I love the whole thing to bits and pieces. Perfect For When You're Feeling: that Robyn's shimmery, dance-floor-influenced heartbreak cuts ("Dancing On My Own", "Be Mine", "With Every Heartbeat") need some company on your iPod. Perfect For When You're Feeling: like fangirling the eff out, whether it's about a cute new prospect in your real life or your "secret" celebrity husband (I have far too many to list here). Hook: Make my lips kiss kiss/My heart go bang (bang)/So what you wanna do with room for two/In my backseat? Best Bit: Boogie Woogie Woogie. Enough said. Perfect For When You're Feeling: so lovedrunk that grammar is a non-issue and only onamonapia will suffice. Perfect For When You're Feeling: that you love him but you don't want to leave him in your rear view mirror just yet. Perfect For When You're Feeling: like what the hell were you thinking? After all, denial is the first step to recovery. For more on Mandy, check out her official site/blog ThisIsCheeky.com, follow her on Twitter or 'Like' her on Facebook.